When Riley Kennon, Ann Bradley Maloney, Lauren Reedy, and Mary Beth Stevens met as toddlers they had no idea that one day they’d be taking an incredible journey together as young adults. This journey begins this week when they all leave for nine months to be a part of a program called Impact 360 in Atlanta Georgia, the inspiration of Chick-fil-a. Impact 360 is a program for 18 – 20-year-olds designed to provide a worldview experience to grow young people into Christian leaders in a secular world. These four girls grew up at First Baptist Jackson and along with their families were involved in just about every ministry in the church, from children to students to music and missions. They graduated from four different high schools this year and stood with a class of forty First Baptist Jackson seniors in May. Every senior on the stage was making a life-changing decision and these girls were no different. 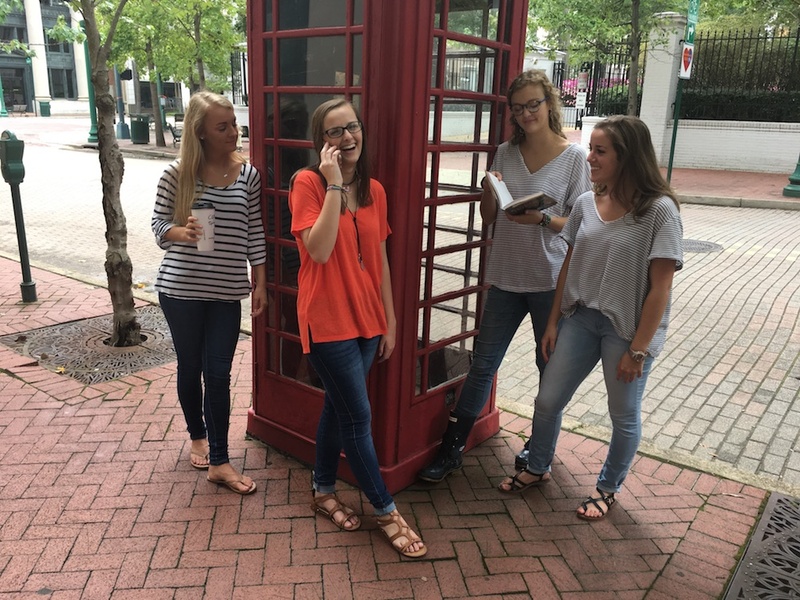 The idea of a gap year with Impact was not new to First Baptist in that Lauren’s older sister Kailee had taken this journey two years before, and two other students, Ava Waller and Hayley Proctor, were inspired as well when a young intern in the First Jackson student ministry introduced the program. “Because of the three girls who have gone before us and then the four of us this year, the younger kids in our student group are taking this seriously and are seeing it is a viable option to grow spiritually and to learn how to live out your faith,” says Riley. When asked why they would delay college (although they’ll actually earn 18 hours of college credit from the program) they all replied that they want a better understanding of their faith and they want to learn how to defend their faith in a secular culture. Since the age window for students in the program is narrow it really is a once in a lifetime opportunity for them. “We all grew up in First Baptist Jackson and we had to learn over the last seven years that the relationships that you make with each other in a student ministry are long-lasting. We’ve had several student pastors during our high school year and we’ve all grown together and we were all mentored by older girls who were in the program because that’s how the program here has been run over the last few years,” says Lauren. “Because of that we’ve learned how to mentor and make relationships not only with students our age but with the younger students too,” adds Ann Bradley. God works in mysterious ways on this and we’ve learned so much. Someone took us under their wing and we know that we’re called to do the same thing,” concludes Mary Beth. Mary Beth, Riley, Ann Bradley, and Lauren begin their journey with Impact 360 the first week in September 2017. Please keep us all informed and involved during your journey. In prayer with love. This will be one of those Spiritual Marker times in your lives I am certain! If you are able, please look up one of our IMB missionary kids who will also be there. Her name is Peyton Davis. Blessings!